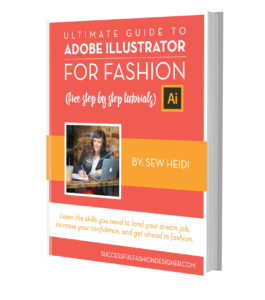 It’s easy to look through all your past fashion design work and wonder how to organize it. You may have hundreds of files scattered on your hard drive, DropBox, cloud storage, and jump drives…or if you’re new to the industry, you may not have enough work for any one category. Either way, it can be OVERWHELMING. Luckily, there is a really simple tricks to get organized and figure out what to show. Footwear brands don’t care that you’ve designed best selling denim collections. Kidswear brands don’t care that you’ve designed evening gowns that showed at NYFW. Menswear brands don’t care that your own “little” brand of lingerie won you awards. I know it hurts. I know it stings. I know you may have years of work you’re really proud of and want to share with everyone. But when a brand is hiring you as a FASHION DESIGNER and the goal of your portfolio is to show off your DESIGNS, you need to include designs that SPEAK TO THEM. There is a place on your resume for all of these other accomplishments (find more resume advice in episodes 6, 11, 29, and 53 of the SFD podcast) and it doesn’t mean they don’t care about your experience. But when it comes to your portfolio, the goal is to SHOW them visually you understand their brand and your work speaks to their aesthetic and their customer. Soon, we’ll go through how many projects you should include and how to choose them, but for now, your goal is to focus on what work speaks to the brands you want to work for. Now…for some of you, I realize that this is easier said than done. So coming up, we’ll look at a few different scenarios. I get it. This is especially true if you’re somewhat new to the industry and you’ve done a little bit of everything. If this is the case, then your fashion portfolio can include a few different projects from different categories. But when it comes to presenting yourself, make sure you show them the most relevant work first. This may mean reordering the pages in the PDF you send. This may mean linking directly to a specific page on your website. Whatever it means, make sure the first thing they see speaks to them (as best as possible based on your experience and what you have to show). Hiring managers spend a few seconds looking at each candidate , and you have one chance to make a great first impression. The statistic is 6 seconds for a resume. I’m not sure what it is for a portfolio, but it can’t be much more. Don’t waste it by showing them irrelevant work. Sometimes, you just need to explain yourself and show them that you’ve constructively thought about what you’re sending. Now, if you do have enough work that speaks directly to them, leave the irrelevant work out all together. 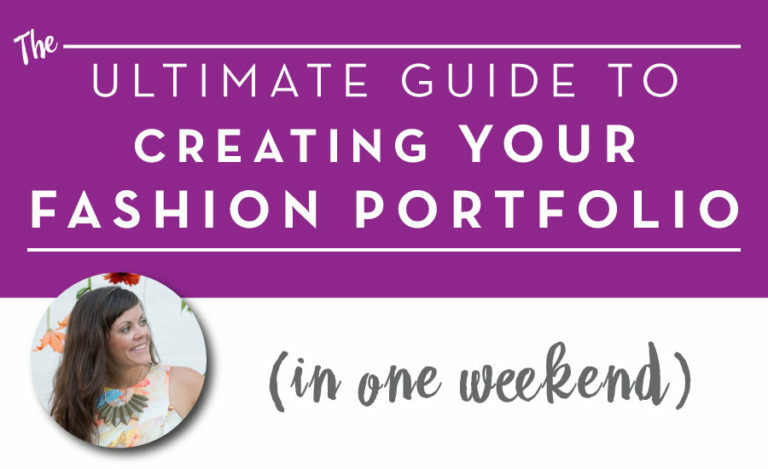 Your fashion portfolio should be focused on quality, not quantity. If they want to see more, they’ll ask. This. Is. Overwhelming. No doubt about it. And I don’t think you’re going to like my answer. But you need to choose the few you want to focus on. I am a firm believer that you cannot be an EXCEPTIONAL mens, womens, kids, and lingerie designer. I am a firm believe that you should NOT include all of your work (especially if there is a huge spread from active to shoes to sportswear). Even if you have experience in all of these categories and you CAN do all of these, what do you keep up on? What trends do you follow? What do you live and breath? But trust me, this doesn’t speak well to brands. It doesn’t show them that you are 100% invested in their market. It shows them that you are desperate and you are willing to take anything. Which is not the kind of person anyone wants to hire. Brands want someone who is confident and speaks to them. And I know this can be hard to “fake” if you’ve been out of work for a while and really will take anything. But if you can convey just a little bit of “this is what I do and I do a great job at it“, they are going to want to hire you more than the “girl who can do anything“. Do you want the guy (or girl) who hasn’t been on a date in 3 years and is willing to settle for anyone? You want the guy (or girl) who even though he hasn’t been on a date in 3 years, stands up strong and knows what he’s looking for…even if it’s really hard to find. Now, I’ll give you some leeway here. It’s not cut and dry. Contrary to what I just said, I’m going to say that you can present yourself with experience in different categories. Brace yourself for some marketing lingo. Don’t worry, I’ll keep it simple and even included a visual. 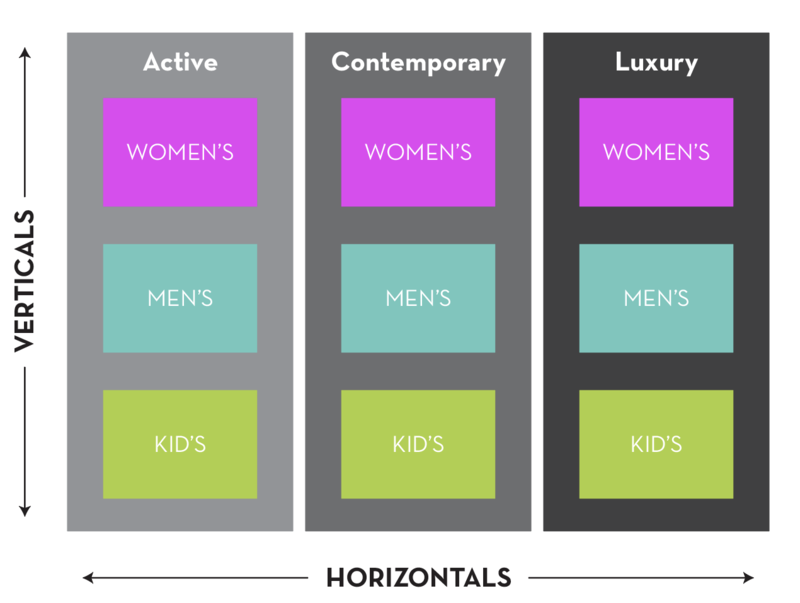 Maybe, MAYBE, MAYBE you can do everything in one vertical / category (ie activewear for mens/womens/kids). You keep up on the fabric and you keep up on the styling (which arguably can somewhat crossover for ages / genders). That can work. Or Maybe, MAYBE, MAYBE you can do everything in one vertical / category for a specific market (ie knits vs wovens vs dresses). You keep up in the trends for contemporary women’s, and yes, this may include knits + wovens + dresses . It can depend on the size of the company. At large brands your job may be as specific as men’s woven plaid shirts and that’s all you do, or at small brands you may do a little bit of everything, men’s and women’s active and outerwear. If the answer is a blaring yes, include it. If it’s a blaring no, cut it. If you’re not sure, put it in the maybe pile. You’re a fashion designer, and this is your job. You understand aesthetics and you have a good eye. Use your senses to really pick the best items that pass the Portfolio Golden Rule. You’re probably not going to like the answer…but it could be A LOT. It could also be NOT THAT MUCH. This is going to come down to how focused you can (and want to be) in your job hunt. The more focused you are, the less it’s going to differ. If you’re looking for women’s activewear, then your digital fashion portfolio should speak to that and you shouldn’t have to make many changes, if any at all. With a strong representation of activewear on your site or PDF, that should be enough to get an interview. For your interview, there are tricks (thank you again to one of my readers, Filiz, for this trick!) you can use to easily update your physical book and really WOW them in the interview. Ready for the (surprisingly) simple trick you can use to customize your book for your next meeting? Here it is: A few swaps of a style or two here and there to make sure your designs speak to that brand is all it takes. What exactly does that mean? It means you spend the time to look through the brand aesthetic and pick out a few key prints, details, or aesthetics and make sure there’s a sliver of that in your book. How do you do that? 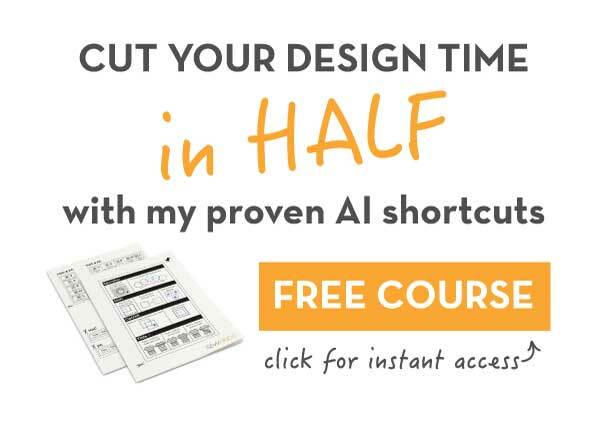 Well, since your layouts are assembled with removable tape, you can easily swap out one or two styles or CAD pages to show something that speaks to them. If the brand always uses lace or sequin accents, make sure you’ve got a piece or two that show that. If they always have super strappy details, include a strappy piece. If they use a ton of stripes and polka dots, put a stripe or dot in. You don’t need to redesign the whole collection, just create a new piece or two to make sure something on that page resonates with them. This may also mean updating a really trendy style that’s now dated. Like swapping a skinny for a wide legged crop, or a racer back for a muscle tee. It really just takes ONE OR TWO things that they’ll see at a glance to speak directly to them. And then BOOM. You are leaps and bounds ahead of the competition. You shouldn’t be applying to 300 jobs and throwing your generic portfolio at every fashion industry opportunity to see what sticks. 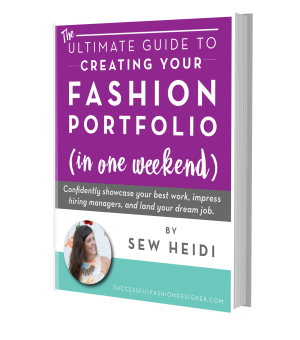 You should be thoughtfully choosing the work you want and customizing your fashion portfolio for the opportunities you want the most. This may mean picking just 10 jobs and sending them something customized. I promise, you’re better off investing 2-3 hours per application to make sure your resume and portfolio is exactly what they want to see. So pick your category (or 2 or 3 if you really insist and want to keep your options open) and create your book(s) based on the brands you really want to go after and you have the best chance at . Yes, that was a loaded statement. Let me explain a little. Later, we’ll talk more about what you can do if you want to change categories or industries. But at some point, depending on where you are at in your life / career (age, financial status, etc), you may need to choose the path of least resistance. 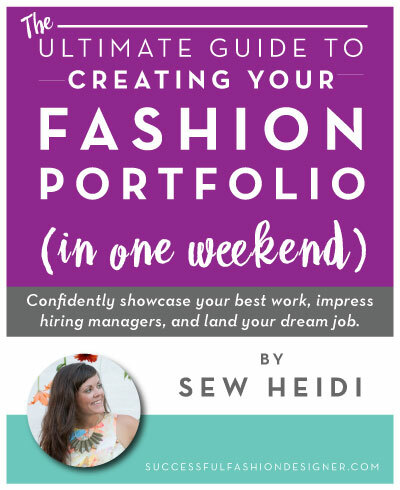 I’m not going to lie, it is easy to get pigeonholed in fashion, and if you’ve done missy denim for the last 5 years, that’s probably what you’re going to have the best chance of when it comes to getting a job with your portfolio. When it comes time to changing categories, your relationships and network are going to do better for you than your portfolio. More on that later, but for now, just something to think about.